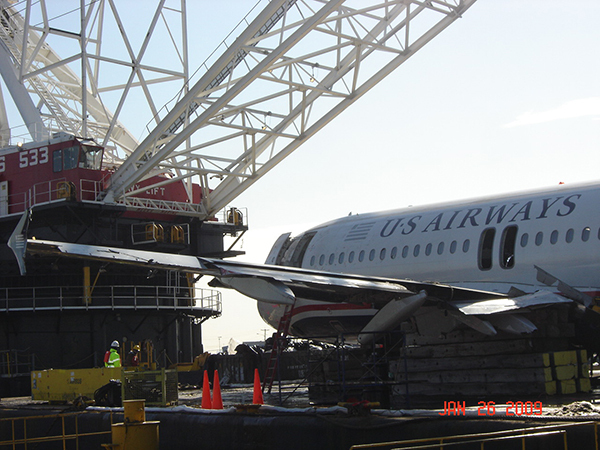 When U.S. Airways Flight 1549 “Miracle on the Hudson” went down in the Hudson River in January 2009, J. Supor Trucking and Rigging immediately became involved. J. Supor Trucking and Rigging requested Peak Engineering work with them for engineering support to assist with the removal of the plane from the Hudson and with the transportation of the aircraft to a disclosed location. Peak Engineering assisted by having a professional engineer on site reviewing rigging plans and transportation procedures. The staff at Peak Engineering worked closely with Supor during the entire process for a successful recovery of the aircraft.